Statoil and Masdar’s 30MW Hywind project off the coast of Peterhead, Scotland, is to be officially opened by first minister Nicola Sturgeon. The site’s five Siemens Gamesa's SWT 6.0-154 turbines are fitted into spar buoy foundations held upright by the weight of ballast, with the steel cylinder tethered to the seabed by a three-point mooring. Irene Rummelhoff, executive vice president of Statoil’s new energy solutions business area, said the technology could greatly increase the areas where offshore projects are viable. "Hywind can be used for water depths up to 800 meters, thus opening up areas that so far have been inaccessible for offshore wind," she explained. "The learnings from Hywind Scotland will pave the way for new global market opportunities for floating offshore wind energy. "Through their government's support to develop the Hywind Scotland project, the UK and Scotland are now at the forefront of the development of this exciting new technology," Rummelhoff added. Rummelhoff expects the cost of floating wind to follow a downward trajectory similar to that of both the onshore and bottom-fixed offshore wind sectors. "Knowing that up to 80% of the offshore wind resources are in deep waters (60 metres-plus) where traditional bottom fixed installations are not suitable, floating offshore wind is expected to play a significant role in the growth of offshore wind going forward," she said. Attending the official opening, Claire Mack, chief executive of Scottish Renewables said: "Hywind’s presence in Scotland is a reminder that, as the windiest country in Europe, and with some of the deepest waters and most promising offshore wind sites, Scotland is perfectly placed to capitalise on floating turbine technology." Hywind was granted a marine licence by the Scottish government in November 2015, effectively giving the project the green light. Installation of the site began in July of this year and took just over seven weeks to complete. 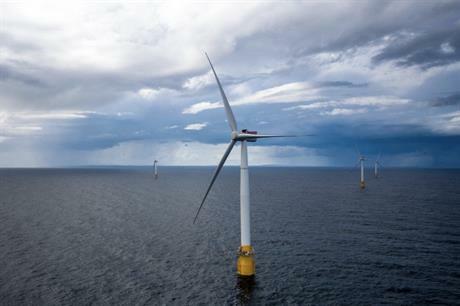 Statoil and partner Masdar also plan to install Batwind — a 1MWh lithium ion battery storage system for offshore wind energy — at Hywind, the companies said. This would help to "mitigate intermittency and optimise output", Statoil added.